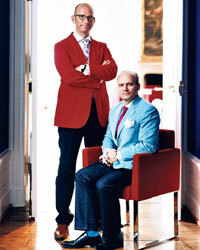 The brothers behind Germany's Sieger Design, maker of a bold new china line, shake things up. Two brothers working in a spectacular Baroque castle near Münster, Germany, are making some of the most modern china of the season. Just reaching stores now is Michael and Christian Sieger's "My China!" collection. It's made of the high-quality porcelain typical in traditional china, but the shapes and designs are fun, decorative, bright and bold—red flowers, blue leaves and gold birds, for example. It's their first effort for Sieger Design (they've worked with Dornbracht and Ritzenhoff in the past), the company their father founded 18 years ago. Today, Michael acts as creative director and Christian oversees the business side. Here, Michael explains their vision. Michael, when did you first know you wanted to be a designer? Quite early—around the age of 10 or 12. I was inspired by our family trips to the International Furniture Fair in Milan. I loved the work of the Italian architect and designer Gaetano Pesce—he is very avant-garde. In fact, there is a photograph of me as a child sitting in one of his chairs at the fair. My parents ended up buying the piece for me. I still have it; it's in my daughter's room. Why did you and Christian introduce your own dinnerware? use cloches every day, but when you are entertaining or need to keep food warm, cloches are very refined! What was the inspiration for the "My China!" line? We were influenced by antique Chinese porcelain in both the palette, which is blue, red and gold, and the patterns, with bird and leaf motifs. China like ours was missing in the market: Many manufacturers who are famous for their innovative designs aren't using the high-quality porcelain we are—we're working with the German company Fürstenberg. Is there a historical period that influenced you? I love Art Deco because it is so elegant. Designers used precious materials to make seemingly mundane objects. For example, they would use silver and gold to trim furniture. So in our china collection, we lined porcelain Champagne goblets with 24-karat gold. How did your family come to find the castle you live in? It was always a dream of my father's to work in a big old house. We looked all over Europe for more than four years until we found this place, which was built in 1752. It is a Baroque castle, but it's more simple than what we think of as Baroque. Christian and I both lived and worked in the castle and its outbuildings until last year, when my brother and his family moved to a house in Münster. How do you combine traditional and contemporary elements? You can combine any styles as long as each is equally high in quality. For example, we have a meeting room in the castle with a rectangular niche in the wall that once held a heater. Even though the niche is trimmed with very Baroque elements, we decided to put a Thai Buddha in it. Contrast is always very interesting in design. We also use a lot of purple in the house. Purple is outstanding for both its quality and luxury. I suffer when I see bad design. Also, I don't like when people try too hard to be unusual or supermodern. I went to a party where they used hospital items to serve food; for instance, they deconstructed a Caprese salad and served it in a test tube. Another thing I can't stand is when people decorate tables with very structural flower arrangements. They think it is modern to put wires and things in bouquets, but I believe it is better to allow flowers to speak for themselves. My favorite flowers are calla lilies, because of their graceful shape. I like Italian food because it is very simple, but wonderful. I enjoy going out to dinner in Italy because you order all parts of the meal separately, so you get only what you want. In Germany, if you order meat they often give you a number of sides. When food is served à la carte, the quality of each component must be excellent because it must stand alone. As you can guess, I am not a fan of nouveau food. I don't like unusual pairings; I like basic, traditional cooking. What party have you thrown that you're most proud of? We had a Venetian-themed party, and we asked guests to come in Venetian Renaissance attire. We set the dining table with red crystal glasses, put up red velvet curtains and hung prints of Venetian paintings. Even the servers were in costume. We made invitations that looked like the colored wooden poles you see in Venetian canals. We used lacquered plastic tubing and put the paper invitations inside. It is really fantastic if you do a themed party like this—after a while, you really feel like you are living in the Renaissance. We also threw a big party last year featuring centerpieces with a bunch of cheap plastic items, like dolls and cars, that we sprayed with silver paint. From far away they looked like Baroque decorations, but if you looked you saw it was a Barbie or a plastic gun. How do you like to dress for dinner parties? It depends on the time of year. In the winter I like to wear long velvet frock coats that go down to the knee. In the summertime I'll wear a white suit. For three or four years I have been designing my own suits that I have my tailor in Münster make. I think most men's fashion is too traditional and boring. I have orange, red, turquoise and purple suits made of velvet, linen and cotton. One of my favorites is a blue-and-red-striped suit that is made of fabric normally used for curtains. We are actually launching a men's clothing line this autumn as part of the Sieger Couture collection, which will be handmade in Poland. The suits will have funny little sayings like "Follow Me" under the collar or "Left Pocket" inside the left pocket. Go to sieger.org for more information on "My China!" From $248 for a five-piece place setting from Michael C. Fina; 800-289-3462 or michaelcfina.com.